I fell asleep etching the image into my mind so that I never forget. 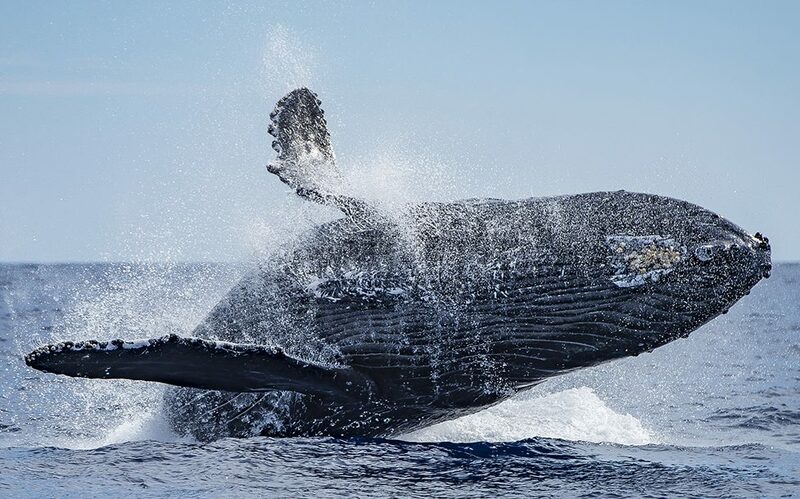 A breaching humpback somewhere near Maui in the Hawaiian Islands. Photo by Scott Methvin. It was a hazy August afternoon on a 34-foot sloop out of Dana Point Harbor; breezy enough for a leisurely sail with a full boat of 11 women, some expert sailors, others shaky on the seas. Listening to the whale sounds on Judy Collins’s “Farewell to Tarwathie” lilting over the cabin’s loudspeakers, the captain and her crew spotted the unexpected — two humpback whales, cow and calf, spouting starboard. As we heaved to, the mother whale soared out of the water sideways, a spinner breach, with one long pectoral fin pointing skyward. Down on her side she smacked the water and submerged, then up again, repeating the spectacle at least a half-dozen times. Before I could finish, 30 tons of baleen whale shot up out of the water in a full breach not more than 30 feet away. With her rostrum arching back mightily, 15 feet of pectoral wings stretched out from her sides and flooding rivulets of water rushed off her fluted underbelly — a spectacular salutation to the sun. The all-out screams of 11 ecstatic women drowned out the rorqual’s thunderous splash-down. Moonlight danced on the bay like strewn diamonds while wavy white ribbons lapped the sand. A movie screen was specially rigged to suspend just above shoreline, seamlessly floating in the sky. The film reflected the buoyant mood of a weekend full of expert round-robin talks on the good and bad news about the current state of the big blue. And then it happened. A larger-than-life-size humpback shot straight up out of the Pacific, practically on top of the crowd. The massive marine mammal acrobatically twisted in mid-air and crashed with tumultuous force, spraying tons of water. As real as it appeared, the moviegoers stayed dry, crowing in awe. That response alone, Campbell recalled, made the weekend well worth a year’s preparation. 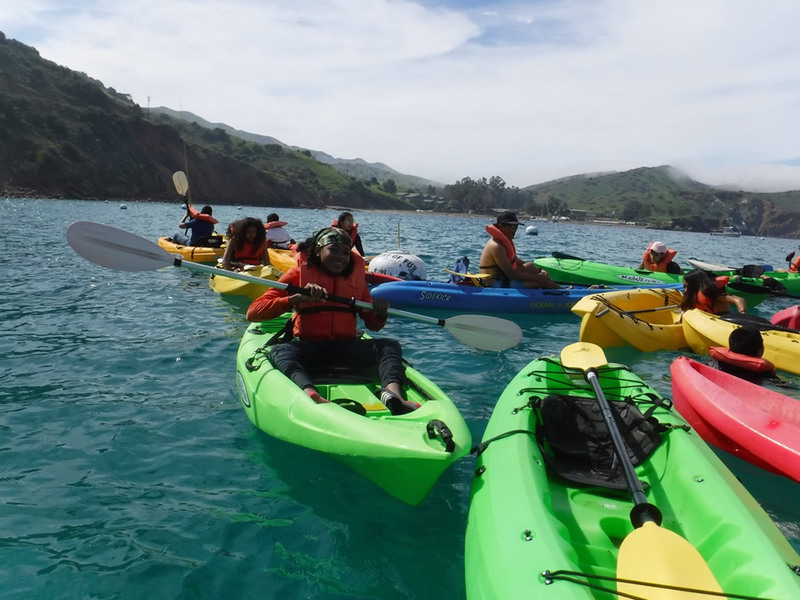 Middle-school students from Pasadena’s Washington STEAM Magnet Academy kick their fear and unfamiliarity with the ocean and kayak for the first time at an ocean-awareness camp last March on Catalina Island, thanks to contributions from OAC. Photo by Susan Campbell. Campbell and her band of volunteer lady mateys are ready to cast off again with their second annual Ocean Awareness Challenge gala seminar, focusing on current hot topics, “Marine Parks, Sharks and Prey.” Staying land-bound this year for one evening, from 4:30 to 9:30 p.m. on Saturday, Nov. 4 (a full moon), the event presents a roster of expert speakers and entertainment at the newly remodeled Festival of Arts grounds, 650 Laguna Canyon Road. Guests are also invited to spend the day whale-watching with the Ocean Institute in Dana Point for a discounted price or taking a tour of the Pacific Marine Mammal Center on Laguna Canyon Road. Campbell, a lifelong ocean-lover and adroit sailor, said there’s no competition for donor dollars. “Ocean Awareness Challenge is a once-a-year event,” she said, with the minimal asking price of $95 for adults, $45 for children. A lmited number of tickets are on sale now. Go to oceanawarenesschallenge.org to register. The price of admission to this year’s OAC event buys an evening of expert speakers: conservation-law expert Michael Sutton (Ocean Champions, COMPASS and LegacyWorks Group), white shark specialist John O’Sullivan from Monterey Bay Aquarium and California Program Director Geoff Shester from Oceana. Guests will also enjoy an authentic Mexican dinner, music from the “Humpback Whales” documentary performed by original-score-composer Steve Wood and his wife, Beth Fitchet, topped off by an encore screening of the movie complete with popcorn and an intro from filmmaker Greg MacGillivray. The island across San Pedro Channel is no longer a mystery for students from Pasadena. 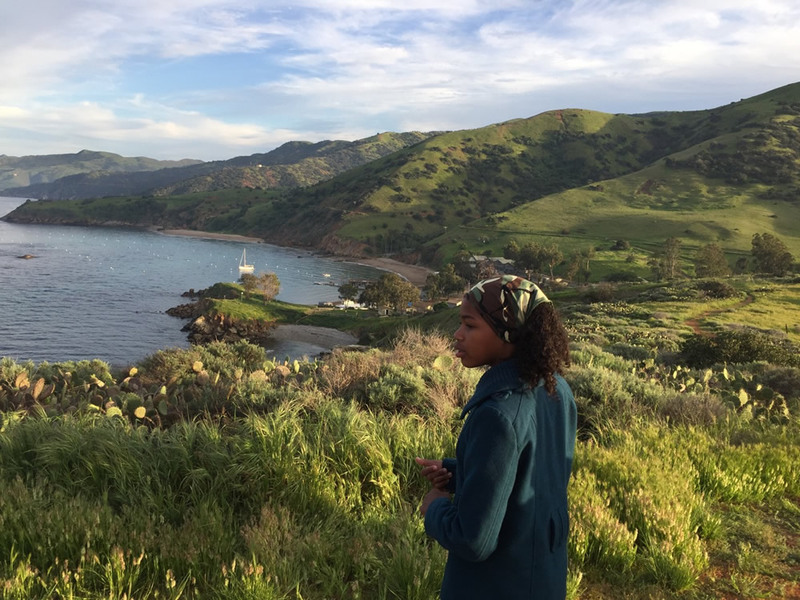 They camped at Catalina’s Emerald Bay during a weekend excursion of snorkeling, hiking and learning about ocean plants and animals. Photo by Susan Campbell. All proceeds will send underserved youth to a three-day camp at Mountain and Sea Adventures in Emerald Bay on Catalina Island. “The ocean is a gift to us, an inheritance for our children and future generations and a life-support system for our planet. Without a healthy ocean we will not be able to survive. And without being good stewards of this precious gift, we have nothing to leave our children,” said Campbell.